I had the most wonderful dream, yesterday. Well... it wasn't so much wonderful as it was interesting. Well... to be honest, parts of it were down-right scary. But it wasn't a nightmare or anything like that 'cause other parts of it were really good. Excellent, in fact. Picture it... Saturday, March 23rd... Nova Scotia, Canada.... at the desk of Nerissa the Cat. That would be my desk, by the way. Anywho... I was workin' away on my blog, gettin' ready for today's post. My eyes started to feel heavy and I found myself yawning, more than once. Not 'cause my post was borin' or anythin'. It was 'cause I had been up late, with the nip, the night before. Still celebratin' my being a finalist for the BlogPaws Nose-to-Nose Best Blog Writing Award, you see. Yup, still celebrating. Now, usually when I dream, I dream of nip. Great big fields of nip. Acres and acres of the stuff. That, and ruling the world, of course. But yesterday, as I drifted off to sleep with nothing but a warm laptop as a pillow, I had my pal Katie on my mind. I was thinking 'bout Katie and her blog, GLOGIRLY. And 'bout her mom and the great big GLOGIRLY DESIGN GRAND OPENING GIVEAWAY! And 'bout how much I'd love to win that giveaway. And that was a lot to think about. I can assure you of that. Guess that's why I dreamt what I dreamt. I woke up and it was a Wednesday. I knew it was a Wednesday 'cause the peep was gettin' ready to go to caterwaulin' practice. I could tell 'cause there were screeches emanatin' from the living room. Practicing, she calls it. Screeching, I say. I glanced over my shoulder and saw that sitting on the floor, next to my desk, was the most beautiful pink tote bag. It was gorgeous, I tell you. I recognized it, immediately. It was the tote bag Katie was givin' away as part of her giveaway. That was when I realized that I must have won the contest. I wondered why the peep hadn't woken me up to tell me the good news but you know peeps... they do silly things. That was also when I realized that I must have been asleep for days and days and days 'cause when I fell asleep, the contest hadn't finished yet. MOUSES! Upon the realization that I had won Katie's giveaway - and was now the proud owner of a beautiful, new pink tote bag - I did what any self-respecting cat would do. I hopped into it. That's what they make 'em for, you know. It was a perfect fit, and everything. There was something kind of lumpy in it though. Something that was kind of ruffling my fur. Hmmm.... now what could that be? Of course, the pen! Another reward for winnin' the contest. A beautiful pink pen. It was unlike any other pen I owned. It was going to be the perfect addition to my collection and I made a mental note to hide it under the refrigerator with the rest of my pens, where it would be safe and sound. I thought I would do that later, after I had a little nap. After all, sleepin' for days on end can make a cat awfully tired. I curled up at the bottom of the tote bag, cradling my new pen acquisition and resting my weary head upon the GLOGIRLY bucks gift certificate, also part of the prize. The next thing I knew, I was rudely awakened as I was plunked down, tote bag and all, on a hard floor, in an unfamiliar place. I tried to get my head out of the bag, to see where I was, but there was something in my way. What was it? Papers of some sort. I managed to get a peek at some of the writing and horror of all horrors... it wasn't writing at all. IT WAS SHEET MUSIC! Oh my mouses... I was at caterwauling practice. You can imagine the things running through my mind. I dug, frantically, at the bottom of the tote bag, hoping and praying that Katie had included a pair of custom-made GLOGIRLY designed earplugs. No such luck. My search came up empty pawed. Then it began. The moaning, the groaning, the screeching the wailing... the practice that comes before the caterwauling practice. No! No!! No!!! No peep should ever sing a high C! It's against all laws of nature. If I've told ol' peepers that once, I've told her a million times. But does she ever listen to me? No. MOUSES! My one peep is hard enough on the ears but here... here at caterwauling practice... there were DOZENS of them. Oh my ears! My ears, I tell you!!! Then, out of nowhere, appeared a little marmalade cat. I narrowed my eyes, tryin' to get a better look at him. He looked a lot like my brother Seville, except that he was little. He was like a little mini Seville. My heart skipped at beat. Had the peep's caterwauling vibrations sent me back in time again? To a time when Seville was merely a kitten? Was I gonna have to live with a rambunctious marmalade kitten for the next year or two? A kitten that would get into everything and drive me up the walls? Then I realized that no, it wasn't Seville at all. It was Katie's little brother, Waffles Too. How did he get there? Had he been in the tote bag all along? Was he returnable?" Waffles Too took his two paws and plunked one on each of my ears. The caterwauling noises subsided. What a hero! I knew that if I got through the next two hours, all would be okay. Caterwauling practice would end and the peep would take me home. We'd have to find a way to return Katie's brother, of course, but not before all the noises stopped. He was really good at keeping the caterwaulin' sounds out of my ears. Then I heard it. "Nissy... Nissy... Wake up! It's time to turn off the computer. Computers aren't beds, you know." I shook my head and stretched a paw. I glanced down at the floor. There was no beautiful pink tote bag. No new pen acquisition. No GLOGIRLY bucks. Awww... it had all been a dream. It was still Saturday. MOUSES! Tee! Hee! What a great story yous tells! 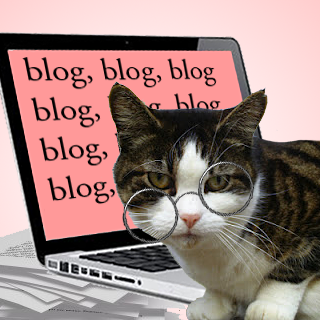 Nissy, your great story of your dream just confirms for us that you deserve to win the Best Blog Writing Award. But WE want to win Glogirly's contest! Wow, you must have had some premium nip before you drifted off! MOL! You have better dreams than we do! MOL! That was quite a dream, Nerissa! Paws crossed that you win the giveaway! Good luck sweet heart, I purr for you to win ! Dang, it was just a dream?!?! I was pretty sure it was real there for a minute! So the cat's out of the bag then? What a pity. There's nothing like a good bag to curl up in. I used to like Miss 21's uni bag. But she's got another home now, and took her uni bag with her. WOW pal - you really had a good dream, well except maybe for the caterwalling! Yikes - talk about hurting our delicate ears. I am sure it will come true soon. What a wonderful and exciting dream. We sure hope you win the Glogirly giveaway! Good luck! What an exciting dream! Although probably a good thing that it was only a dream as I don't think Katie would have let you return Waffles too and he would have been annoying you instead! That's such a special dream! Good luck in the drawing! ...you never know, your dream might come true! By the way, have you tried mailing upsetting elements in your household to somewhere far away? It might save your feather toys. Were you having a "Cat Nap" Nissy? You never know dreams can come true. Ask you peep if she would like to join the #CatsChorus on Twitter. Allie: Oh Nissy, trust me. You do NOT want Waffles Too over there in ANY form, dream or otherwise. FaRADaY: W2! YESSS! He's our Man! Err, Cat! Uhhh, MAN Cat! Got your message, Buddy! Say, come see MY prize from Mollie!